More summer musical partying, and another ten-year-old dream fulfilled! Abby and I went to a party at Gina’s. We hadn’t been over in more than half a year. We had a great time, sharing a ton of food (I made a cabbage dish of my own invention that included onion, garlic, olive oil, cumin seeds, thyme, lime juice, salt and pepper) and hanging out inside as well as in the backyard. I somehow started an arm wrestling competition with the guys, and then we challenged each other to pullups and chinups too. I also ended up playing three games of speed chess at a time handicap (my 3 minutes to his 10 minutes). I barely managed to win all three games. The final game should have been a draw, but I won through a swindle. I told Henry I was much improved musically since we played together two months ago. A lot of things have been falling in place for me. Of course, this only makes me be more ambitious about music to play, and in return, get humbled yet again by how much more improvement is left for me! 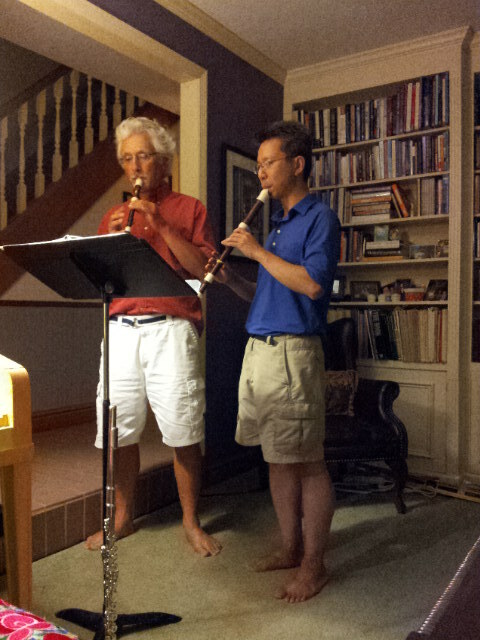 One piece we tackled was Telemann’s flute sonata in B minor, TMV 41:h4. I had only actually gone over the first two movements, so we were both sight reading the last two. That was something of a wreck for me, but gives me homework to do: originally I had not actually planned on learning the whole sonata, now I want to! Another piece we did was Bach’s flute sonata in E major, BWV 1035, which I have already mentioned my obsession with in a blog post over three months ago. Note: I am still not playing this on Baroque flute or modern flute, because of the difficulty! I have been working with a recorder transcription for F major. Because I have actually been playing more of this sonata myself in the past months, I have come to change my mind about performances I listed in that blog post! There is nothing like actually studying and playing a piece of music to change one’s perception of it. Anyway, Henry and I ran through the sonata. Again, I had not actually ever run through the final movement, so it was an embarrassing sight reading scramble for me. But he really enjoyed the last movement, and I did too, and realized that I wanted to actually study and practice it. It’s funny how I came to enjoy this movement much more after having tried to play it. After all the Baroque stuff, I decided to play something different with Henry. I pulled out my modern flute, and we did Fauré’s song “Après un rêve” in a flute and piano arrangement that I bought in 2003. Here’s a story I have never told anyone until now. Eight months ago, I fulfilled a childhood dream, by throwing myself into singing, and in fact, one song I did sing was “Après un rêve”! I still don’t sing it as well as I’d like, and will continue working on singing it, but singing in general has had a tremendous positive transferring effect on my flute playing! I am now almost able to play “Après un rêve” how I want (the remaining difficulties being cleaning up the high passages in the arrangement as well as controlling the breath there as well). In any case, I went and played it with Henry for the first time, and it wasn’t horrible. In summary, ten years after I bought that score with wishful thinking, I made my dream reality. The surprise of the day was when, after watching me mess around with bass recorder, Henry got the idea of playing recorder duets with me. I hadn’t known that he played recorder. He said he could play recorders in C (soprano and tenor), and since I didn’t have my tenor on me, I gave him my soprano recorder. He picked up a book and went through it to find some early music duets that we could do on recorders. We did some with soprano and bass, then I switched to alto and we did soprano and alto for the rest we found in the book. It was immense fun! I feel blessed to have the opportunity and inspiration from Henry to continue improving at playing music, and stretch myself further. I have come so far in the past two years.